Throwing a boomerang is just plain fun and has a lot of benefits that are overlooked today. Besides being a useful hunting arm, throwing a boomerang can be good exercise while dramatically increasing eye hand coordination. Anyone who shoots a bow, throws a spear, swings a bat, stick, sword, golf club, racquet or throws any kind or size of ball will benefit from learning how to throw and practice regularly with a boomerang. Since Cold Steel is in the business of making things to throw, it was only natural for them to try and improve on the boomerang by making their own, non-returning version. 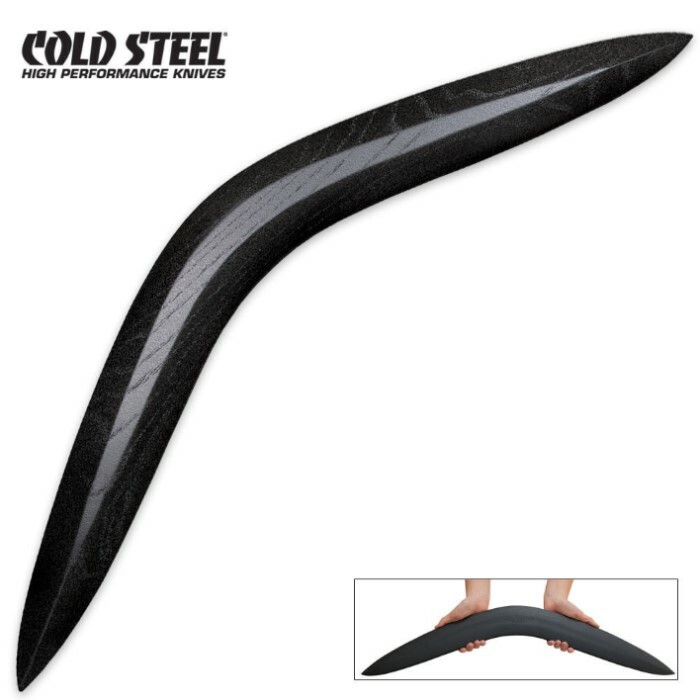 Injected molded from high impact Polypropylene, with a wood grain surface texture, and sporting the most aerodynamic length, shape and cross section, this sporting boomerang fills the need. You can use it for hunting, target throwing, and distance throwing and, in a pinch, it will also serve admirably as a highly effective self-defense tool as well. The boomerang, or throwing stick has been used on every continent from time immemorial and is still found in use as a hunting tool in isolated pockets around the globe even today. Fashioned in various shapes, forms and sizes and made from wood, bone, horn and even metal, it was most effective when used to harvest game birds, water fowl and small game. Today, the boomerang or throwing stick is most closely associated with Australia where many original inhabitants (Aborigines) still posses the skill and knowledge to use them to put meat on the table. Affordably priced and incredibly durable, this boomerang is fun for the whole family and will provide years of hard use and entertainment. 7 in. height, 28 in. overall, and roughly 1 1/2 LBS. Very sturdy boomerang. It arrived within 3 days (along with some other orders I made). I've been practicing with it for a few days, and I am very satisfied with its design. One complaint though, as I was walking with it sticking out of my bag, it feel out and scraped away the paint at one of the corners. Needless to say, this is design for large fields and NOT urban concrete jungles. All in all, still a good product.